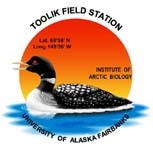 » Methane and carbon dioxide emissions were monitored in control, greenhouse, and nitrogen and phosphorus fertilized plots of three different plant communities, Toolik Field Station, North Slope Alaska, Arctic LTER 1991. The main focus of the experiment is to determine the importance of climate controls (temperature and moisture), the effects of nutrient availability, and the source of carbon and reducing power for methanogensis in the tundra system. To obtain this type of information methane and carbon dioxide emissions were monitored in control, greenhouse, and nitrogen and phosphorus fertilized plots of three different plant ecosystems; 1. Wet Sedge Tundra 2. Tussock Tundra 3. Heath Tundra The treatments were started at the Toolik site in 1989, In 1991 the fertilized plots received 10 g N per m^2 in the form of ammonium nitrate and 5 g of P per m^2 in the form of phosphoric anhydride. The schematic below shows the SITE, ECOSYSTEM, # of BLOCKS within each ecosystem, the TREATMENTS (CT=Control;GH=Green House;NP=Nitrogen and Phosphorus additions) and the # OF CHAMBERS PER TREATMENT. *In the TUSSOCK ECOSYSTEM Chamber bases were around tussocks only. Version 6: Updated to newer metadata with site sheet. CH March 2013.